As comments to my last post have shown again (because this is a common argument amongst GT-R owners), people tend to like one car model over the other for subjective reasons. “This one looks better” or “this drives better” or “this one has more road presence,” etc. And there is also a lot of erroneous information out there too, most notably “the R33 GT-R is heavier than the R34 GT-R.” It’s not, the specifications by Nissan clearly show the R34 was 20-30kg heavier than the R33. (And they would have no reason to lie, they WANTED the R34 to be more compact (hence the shorter wheelbase), because one of the criticisms about the R33 were that, compared to the R32, it was heavier and bigger). Therefore, I think the only measure of “better” I can agree with is, a comparison on an objective basis – what was changed and why (from a mechanical/engineering standpoint), and the effect that would have on the car (how the improvement was manifested). So, I have begun hunting for written materials, preferably in Japanese with interviews of the actual technicians, engineers and test drivers who worked on the cars, discussing these changes. Finally, it would be ideal to have an article discussing the difference, if any, these mechanical changes made in the official lap times of the R33 and R34 at the Nurburging. Although I’m still looking for other articles, here is one I found which I think does a nice job. From Gold Mook GT Series, "BNR34 最速の証明"(BNR34, Proof of Speed), February 2, 1999, which was published when the R34 GT-R was first introduced. It traces the history of testing at Nurburgring for the three second generation GT-Rs, and talks in general terms about the mechanical differences. And most importantly, its job is to excite and inform the reader about the BNR34! So for the R33, the mandate was clear –to go even faster, with higher abilities. So the R33 came with ET-S PRO (active diff), 17 inch wheels, Brembos, electronic HICAS, etc. – all in all a technically much more advanced car than the R32. Thus equipped, we know that the R33 was able to shave 21 seconds off the time of the R32 – for a record setting (back in 1995) time of 7 minutes, 59 seconds, set by Dirk Schoysman. This result was heavily publicized by Nissan, the first production car to break the 8 minute barrier. So what happened for the R34? The article does not give a recorded best time, nor does it even mention if the R34 was faster than the R33. But the interviewees reveal that, faster is not what they necessarily wanted. They also talk about the mechanical changes that were made compared to the R33, and why. First discussed was an improvement of body rigidity. This was necessary to begin with, as in initial planning it was decided that the car would have 18 inch wheels, and there would be an increase in torque (note: at the time the article was written, the manufacturers still had to pretend that the maximum horsepower the cars produced was 280 ps – but there was no gentleman’s agreement to limit increases in torque, even though the reality is that every increase in torque also meant an increase in horsepower). Next up were the aerodynamics. Using data from their racing experience, they first outfitted a front under-panel, which made immediate improvements. Then, of course the rear diffuser, which test driver Kato claimed “made an bigger difference than expected.” The effects were felt starting at 80kms per hour. The benefits were an increase in steering feedback, and strangely, quieter running. At Nur, the body stayed planted to the ground, and not with excessive downforce. Strangely, these are the only two differences mentioned in this article. The rest of the article talks about testing methods (how they used a Multi-Road Simulator to test body rigidity, for example, as well as, for the first time, an onboard Marelli data logger). There is mention of course of the shortening of the wheelbase, but not on its effect, performance-wise. No mention of weight differences, nor changes to the suspension geometry, etc. So what can we conclude so far, based on this article? Yes, there were objective improvements made to the R34 over the R33. But nothing that would make the car “faster” per say. Easier to drive, maybe. And when you think about it, I would argue that is what Nissan has done with the R35 as well – made it incredibly easy to drive fast. As someone who enjoys actually driving his car, versus being taken for a ride, these second generation GT-Rs are the way to go. AND, on a SUBJECTIVE basis, the R33 is the best fit for me. As before, would love to hear everyone's thoughts on this topic. Here is a historical list of lap times by various cars at Nurburging. Note2: Apologies also to those readers who were expecting another parts review or tweak on my car. With the horrible weather and a busy schedule, have not had time to do much to my car other than keep it clean. Any spare time at night I am either working, writing for GTROC.org (follow my weekly R35 GT-R build) or trying to catch up on sleep. This however should change in the near future, with the warmer weekends ahead. I have several projects in the pipeline yet! Great article to read Aki, I must say here in Australia at least, I think there is the whole 'R32GTR' is so great because they are affordable and the 'R34GTR' is so great because it has the looks mentality and the 33's are kind of stuck in between. I personally think the R33GTR stands at the midway point between affordability for all three models, and so buyers in the market for a GTR will be either looking for an affordable example or have the money to spend for the later model R34. Like I said in my previous post, I think the R33GTR has the best mix of affordability, looks, reliability and handling for the price point they currently sit at. Yeah well that IS the reality, there are so many R32s and they are older, so cheaper, and the R34s are relatively rare and has the boxy looks. Good point - the brakes and the suspension were essentially carried over from the R33 to the R34. But another point the article failed to go into detail was the Getrag 6 speed upgrade. Anyway, I plan on trying to find more articles like this, if only to, if ever, figure out exactly how fast the R34 DID lap Nurburgring! At the very least though, the technical changes are very interesting and give insight into how Nissan thought THEY could improve the R33. Some hints for us? Hints indeed! Add body rigidity! R33's are best fit for me too - much more reliable than R32's and much cheaper than R34's. Keep up the good work Aki. What a great find, here in Australia, as a result of the success of the R32 in Aust Touring car racing, the R32 became an instant hero amongst the locals. And it still is, the legacy remains. There was however never a question with me that the R33 was a massive improvement over the previous model however many felt the R33 lost the hard edged appearance of the 32. This of course is purely subjective. Anyone I knew who really knew how to take a car to its limits and sampled both models, unfailingly declared the R33 the more accomplished performer. The argument was often that the 32 was more fun, and that would ring true for a car which is easier to take to the edge as a result of that edge occuring at lower and possibly more sane (relatively speaking) speeds. This remains consistant with your article. I also often wondered why the R33 was considered the poor cousin when it was the one which blitzed the Ring run. The new E92 M3 still doesn't manage this time 17 years on I believe. Quite a feat. The R34 then, was clearly a stiffened and rebodied R33. Under the skin, it looked identical from what I could see. Not sure if this is the case truly nor to what extent, but just from what I inspected. Hoever the 34 became a hero in the pages of Playstation and its ground breaking on board electronic display if you like that sort of thing. I'm not a 33 fanboy, I love them all, but there can be no question that the R33 is the most accomplished package for me. Not only in terms of price, but also in terms of purity. Gorgeous styling, none of them really look anywhere near as tough on the road as a 33 with a wide stance, equipment which is there purely for the purpose of the performance, and dynamics way beyond its time. The 34 I would agree in standard form is the improved car, and if I were buying a GTR, and the 34 looked as good as the 33, then that is what I'd buy. But as it doesn't, and the improvements are minute, the R33 is surely the one to have, regardless of price. If there was a way to shake your hand right now, I would! Very well written! I will endeavor to find other similar articles, and try to figure out in more detail exactly the differences between the R33 and 34. I'm curious to know how the body was stiffened, as I would think that could be replicated in part on the R33. I have also stumbled across articles talking about the technological advances of the R33 over the R32, and may publish summaries of those as well. Stay tuned and thanks again for your most excellent analysis! It's an interesting analysis, as mentioned, here in Aust, I've found that general car enthusiasts prefer the R32 based on the racing history and their impact on the local rivals. Their arguments toward the 32 being better than the other two are almost always that it is the original, it is the only true Godzilla. Bit like saying the new Iphones are not the ones to have, as the first was the original and therefore the best. Fair enough if you don't like advancement and improvements in performance. I rarely hear any other real arguments to support the choice apart from the subjective on aesthetics and of course that fun factor. However I know people who believe more fun can be had in a small 80's rear driver on street tyres than in a current build 911 on semi slicks due to the ability to reach and control it at the limit. I think the same thing fits here for the 32. Then the R34 seems to be the choice for the younger generation here, this is why I blame the playstation and comic book representation. When you ask a youngin here which is his fave GTR, they almost invariably blurt out R34 before you've finished the sentence. This is the cult car for the gaming generation. Ask a gamer which is best, I bet they tell you the R34. I can only come to this conclusion as many of them are not yet old enough to drive or have not been drving long enough to have been able to really appreciate a vehicle's complex dynamics. This is just my observation. Again, the subjective question of looks also plays a part. Then there are those that have truly had the privilage to sample all cars. I also have but not to a large extent. Many of the enthusiasts I know have or do live with them. I know of 3 guys locally who could afford any car they choose. Two of them I know well, all three have had experience with all three generations and one of them owns a tuning workshop. The two I know well both have an R33 and an R34 Vspec II Nur (not jealous at all). And they both leave the R34 in the garage and spend all their money on their R33s which they take regularly to the track to add further frustration to cashed up Porsche owners. Interestingly, they both share the same thoughts when asked of them why they use the R33 on the track rather than the 34. I assumed it was price, it wasn't that at all. 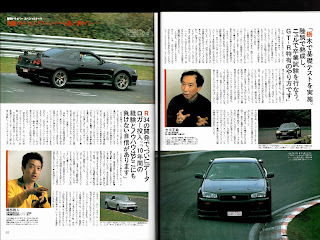 They simply felt the R33 was the better car dynamically and therefore a better base from which to build upon. The workshop owner currently has his 34 Nur for sale and has bought another 33 for the road. He currently has 4, one is a fully built track car. So there you have it, not my argument, as I said, I love them all, but these are just my humble observations. Ohhh...... and the 33 can undoubtedly be braced to be as rigid and more rigid as the R34. They are incredibly similar underneath. Jayel - exactly what I think, couldn't have said it better myself - especially the part about the R34 playstation/comic book thing, lol. Most interesting about what your friends say. There is so much unlove on the R33 here in Japan, I have NEVER heard anyone admit that. Next time I'm in OZ I am buying you a drink! Matt, you want to join us? And I too have found it strange that Nissan put so much effort into making the 33 so fast around the Nordshleife, to then appear to not bother so much with the same development of its successor. Your acticle describes this well. Another interesting observation I had was the performance of tuned GTRs. As mentioned, I just love them all, so I often go searching youtube for videos on all of them, and for some reason, the majority of videos that put the different models against each other, typically have the R33 being the quickest. Whether in a drag race or a circuit run. I don't know why this is as I would assume they are all just as tunable as each other. Really enjoying going through your blog Aki, love the detail you go into with your car and the experiences you have through the process. Makes me want to go to Japan for 12 months. Excellent analysis Jayel, echoed my thoughts exactly. I am from the gaming generation and a reasonably new owner of a 33 GTR (If three months can be considered new :P). I can say that I grew up with games such a need for speed and movies like the fast and the furious pushing the R34 into my head as the be all and end all of the GTR's (It would be the only one many of my generation have seen)with pretty much everyone not being old enough to remember the R32's flying around Bathurst. I would have loved an R34 if I had the money and would probably buy one in a heartbeat if funds permitted and it was bayside blue but the R33 has its own unique styling and charms, at first I wasn't even sure I liked the car but it really is hate it or love it and the more I was around them the more I began to fall in love. With many people dividing themselves amongst the various models many people view the 33's as the red-headed child of the family but it really is the star performer. I wouldn't give up the time I've spent with my car so far for anything and the bang for buck ratio is incredible! The only problem now is that the selection of parts available for the 33 as opposed to its siblings in some areas such as cosmetics is rather limited. Adam - thanks for commenting! Quite brave of you to come out and be honest like that! LOL! I have to admit, when I first started shopping, the cost of a really nice R34 was obscene, but what put me off more were the people who knew nothing about the GT-Rs but were fans of the R34? Hence I figured I'd be different...and yes I found myself being impressed by the bang for buck/and the unique looks too! What part you looking for? I share your frustration - I was wanting to put on those carbon mirrors that Mine's makes but was told that demand for them was so low they don't make them anymore for the R33... sob. I already have a few little mods here and there that came with the car from Japan and wanted to keep some nice authentic parts rather than the copies that are so common. I'm not really looking to show the car off and point out all my "awesome JDM" bits but I want to do the car justice by not slapping cheap gear all over it. Adam - agreed you should try to stick to name JDM brands as much as possible... it saddens me when I see people with really nice cars but they have knock off parts (maybe it's an access issue, maybe a budget issue?) IF it's a budget issue, I wish people would save up a bit more for the real thing, so good on you with your search! BTW I am starting an R33 GT-R only page on Facebook. If you are interested and have photos to share, happy to post them up. Just a quick comment from someone who went from a 1998 Series 3 R33 V-Spec to a 99 R34 V-Spec. I'll admit, the biggest reason I sold the 33 and went for the 34 was for the looks. I am not in the 33 haters club, I think it looks good too, but from the first moment I saw an R34 GT-R I knew that that was the one that I wanted. Anyway, I pretty much payed twice the money for my R34 than what I got for the R33 when I sold it. Worth it? For me, yes, simply because the R34 was the one I always wanted and it still gives me a kick to see it, and drive it after 4 years of ownership. Paul - thanks very much for your comment! Very interesting perspective, and from someone who has owned both, in similar conditions. I also like the way you describe the R34 vs the R33, without the usual "it's better" nonsense. I would be the first to agree that the R34 is the more modern car. And yes, the article is basically talking about how Nissan tried to make the car easier to drive. As for refinement... well, what do you think I am trying to do with my car? LOL. Thanks again for your comment and hope you continue to enjoy your 34! At the end of the day, I love all the Skyline GT-Rs, the history, the racing pedigree etc. I shall continue to enjoy my R34, thanks. I hope you continue to enjoy your R33 and I look forward to reading all the updates on your Blog! Thanks Paul! The next few mods I think will be trying to modernize the R33 a bit. Stay tuned! I am included in the playstation gen., and learning about the GT-R's heritage before made me want to own one someday even more. It's a dream car. And thank God my dream came true after all. ;) We are all lucky owners of this true jdm legend. 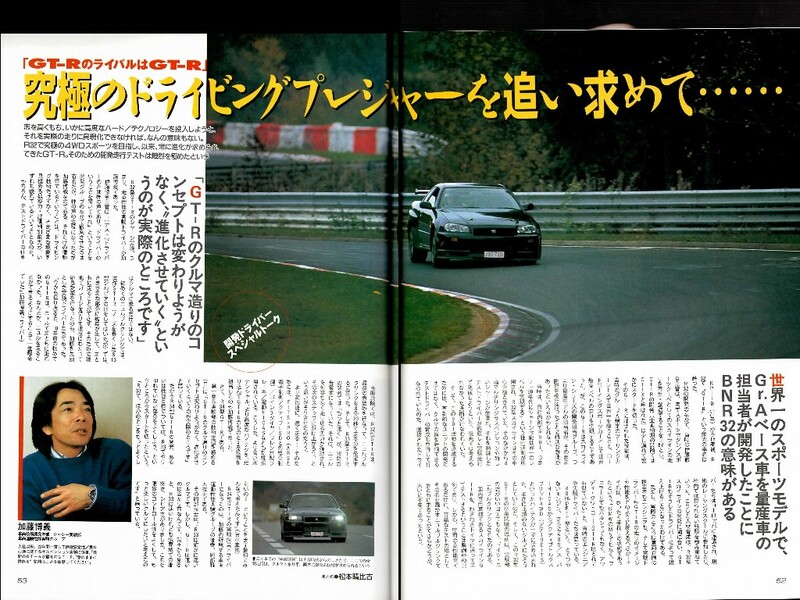 "Nice write up, but I think I too need to comment on this GT-R bros. comparison, and why the BCNR33 was considered the black sheep or the least achiever of the bunch. :)". The word "why" is missing. Anonymous - absolutely correct! The R32 was an extremely hard act to follow. That, coupled with how the R33 was built on a longer wheelbase chassis, really did change people's expectations. As for motorsports, not sure you are correct when you say the 34 had more motorsports history - remember that the 33 actually ran at LeMans and other races with the RB26 engine. The 34 was also involved in racing, but I think the successful ones (and if I am wrong please correct me) had the V-8 instead. But in any case, the 33/34 do not have the race pedigree that the 32 does. But in any case - yes, we are lucky to own such legendary cars - and also lucky that we are all able to choose amongst 3 legends, according to our own personal tastes!